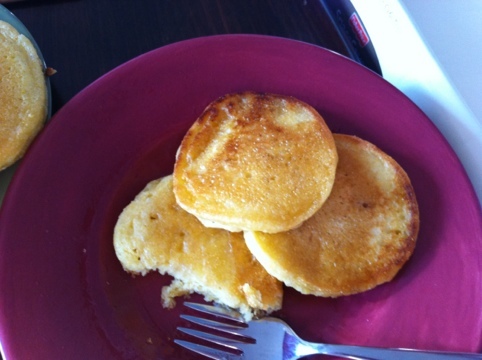 This morning I channeled my inner Paula Deen and made hoe cakes for breakfast. I’ve been wanting to try them for awhile now and this morning just happened to be the perfect time. But fair warning – these are in no way healthy! To make dairy-free I used soy milk mixed with about a half teaspoon of apple cider vinegar in place of the buttermilk (let stand a few minutes to thicken and curdle). I also used Bob’s Red Mill egg replacer instead of the eggs. Finally I did not have self rising flour so I used all purpose flour with a little bit more baking powder and salt. Didn’t measure so not sure how much but couldn’t have been more than a half teaspoon each. The batter mixed up easily. 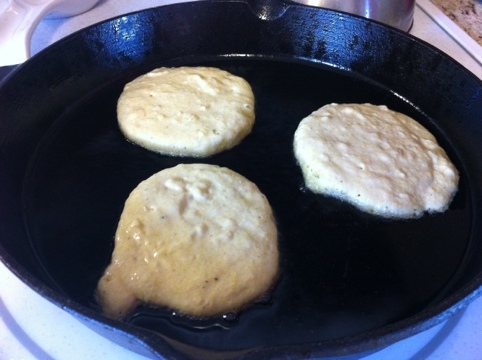 I used a quarter cup measure to drop in the preheated oil in the cast iron skillet. I had to add more oil halfway through. I ended up with about 10 various size cakes. I put them on the table with Earth Balance and maple syrup. But no butter or EB was needed! Just drizzle on the maple syrup and enjoy the salty-sweet combination. Let’s just say hoe cakes may be my new favorite breakfast. As you can see I dug into them before I remembered to take a picture! Benzo agreed they were delicious and even Baby Jack enjoyed a few bites. I plan to make these again soon so if you have any good variations please share them with me.